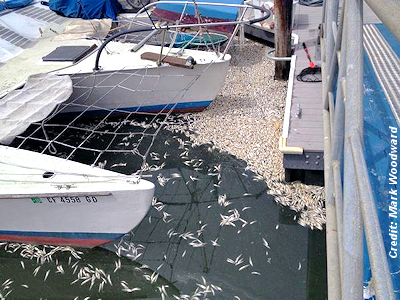 Thousands of dead fish, termed anchovies, have resulted in stinking of the Necanicum River. These fish died while swimming upriver on 28th of July at Seaside, Oregon. . . .Continue Reading . . .
A type of potentially toxic algae known as “red tide” is blanketing an area roughly the size of Connecticut in the northeastern part of the Gulf of Mexico. CHESAPEAKE BAY, Va (WAVY) – Thousands of dead fish appeared on the surface of the Chesapeake Bay over the weekend near the northern end of the Chesapeake Bay Bridge-Tunnel. Continue Reading . . .